On Second Scoop: Ice Cream Reviews: Nick in NYC : Round 3 : Brooklyn Bell, Konery, Mikey Likes It, and OddFellows. Nick in NYC : Round 3 : Brooklyn Bell, Konery, Mikey Likes It, and OddFellows. [By Nick] ‎Since my last NYC post, I've been down to the city on three occasions for various reasons. I also hit up 3 different shops including OddFellows on two of those occasions because I have a problem. Let's start things out with my most recent trip to Brooklyn Bell, The Local first. Oh, be sure to read the whole post, there's flavors you won't want to miss out on throughout it! Just some of my stops along the way. You see, I was invited down to Brooklyn by The Konery to check out their work space for lack of better term. 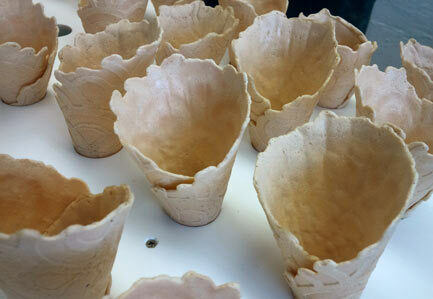 For those who don't know, The Konery makes artisanal ice cream cones with creative flavors and a unique design. 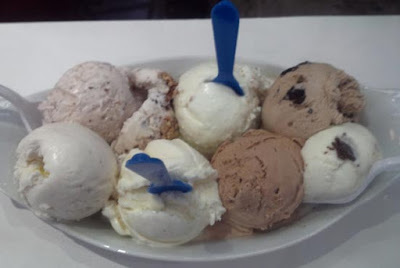 You might have actually seen or tried their cones before since The Konery makes cones for some of the major scoop shops in the city like ‎Ample Hill, DF Mavens and now Milkmade. Quick side bar. Remember how I said I had big news for Milkmade? Well Diana will be finally opening up her own scoop shop! For those who didn't want to subscribe to her pint delivery subscription, you can now try her ice cream by the scoop starting May 29th at 204 Sackett Street in Brooklyn. (Hay Rosie's old location) Be sure to stop by and give her ice cream a shot. I swear you won't be disappointed and who knows, maybe you'll run into me one day ;) Back to the original story, The Konery makes some tasty cones and I'm thankful Kristine brought me in to show me her business. Watch out for an On Second Scoop custom cone once I can think of something she has yet to try to make! This story will come full circle, don't worry. See she contacted Brooklyn Bell about using her cones not too long ago. Well I had a bunch of her cones with me after my tour so I decided to take them with me to the shop and try to make a partnership happen. According to Brooklyn Bell's twitter, it seems like I'm doing the job of the ice cream gods. Anyway, Brooklyn Bell is a relatively new shop. They actually went into the ice cream business more of the opposite way to the traditional route. They started doing wholesale first and the scoop shop came later on. It's a nice little space and they had 6 or 8 flavors on hand while I was there. 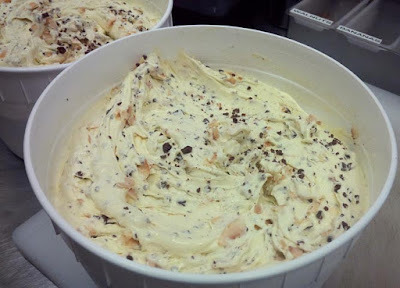 (my memory may be slipping but I believe)‎ Ron hooked me up with two gigantic scoops of ice cream, one of Maple Butter Pecan and one of Cookies & Cream. How shocking I ordered those two flavors... I'm becoming predictable. Anyway, they make a very good product. The ice cream quality is up there with the best, using Hudson Valley dairy in their products. While the flavors are simple, they're execution is great. My favorite part is the huge chunks of mix-ins they had. Both the pecans and cookie chunks were gigantic in each flavor and I loved every second of it. Think of Graeter's style chunks. Definitely need to take a trip back and try out more of their flavors next time I'm in the area. I did sample their uniquely named Black Lava Caramel and it was delicious and gives me hope that burnt caramel will take over salted caramel soon enough. Next up is Mikey Likes It in the East Village and they celebrated their One Year Anniversary yesterday! I went there after a show at The Gramercy Theatre last month and got hooked up with all 8 flavors they had on hand. While they're famous for their waffle ice cream sandwiches, I thought it would be best to sample their ice cream on its own. Mikey's is a nice little shop and the staff including Mikey in the back were more than friendly. Mikey even came up to me and my friend asking us if we wanted water or anything from across the street. Mikey didn't even know who I was so I wasn't getting special treatment either. He knows how to run a business and keep his customers happy. ‎Since there's 8 flavors, let's stop from the top left and work our way around clockwise. Pretty In Pink: (top left) I was not a big fan of this. While the quality is there, it's just too much balsamic for me to handle and it overpowered the strawberry flavor. The Master: This one wasn't on the menu but there was a little bit left for me to sample from a special event they had from‎ a benefit involving Jam Master Jay Foundation for Music. It's double strawberry and double banana ice creams with Toblerone and Praline Pecan. It was one of my favorite of the bunch. It had that fruity strawberry banana combo you experience and the mix-ins reminded me of granola. I wish there was more than that tiny strip because I could've eaten a pint's worth right then and there. Ice Ice Baby: This is their signature vanilla and a great one to be exact. I'm not sure what makes it triple vanilla though there did seem to be some sort of small chunks involved. Certainly a strong vanilla that I could see working perfectly in their waffle sandwiches. Foxy Brown: (top right) This was my favorite of the bunch. The mocha flavor is strong but well balanced. The coffee doesn't dominate the chocolate and vice versa. Throw in generous amounts of crushed Oreos and a salty sweet caramel swirl and you have a recipe for success. This one I would buy over and over again with no shame. Chocolate Thunder: I kind of wish this was called chocolate rain right now. Anyway, it's their signature chocolate this time, being a quadruple chocolate to be exact. They really like multiplying their flavors, don't they? It's a really great chocolate though. It's more towards dark chocolate in flavor and is very rich. I could see it going well in a sandwich featuring their red velvet waffles. Honeydew: Yeah, this wasn't on the menu either and all I was told is they had a "new, refreshing honeydew flavor". They were right on it being refreshing. It was my palate cleanser of choice in-between flavors. It tastes exactly like biting into a slice of honeydew just with the consistency of ice cream. No complaints from me and something I can see being very welcomed with the brutal heat we've been having as of late. Moon Walker: (bottom left) ‎Last but not least is their flavor of the month from April. 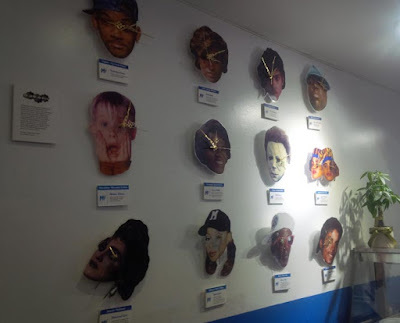 They like to make flavors based on pop culture type stars and it was Michael Jackson's turn to grace their walls and get his own clock. However, the moon walker fell flat for me. The double banana ice cream is the perfect amount of ripeness for me which says a lot with my banana flavored product standards. Sadly, mine was void of mix-ins. Such a shame when Oreos and crispy m&ms are involved. Only sign of them were some coloring from the m&ms and a few Oreo crumbs. From seeing other peoples' photos, I think I got a oddity. Oh well, not like anyone can try it anymore anyway since we're now almost 2/3rd through May. 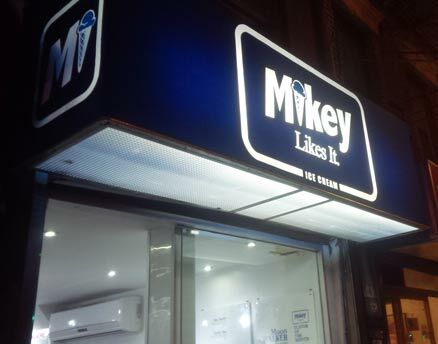 There you have it, 8 flavors from Mikey Likes It. Next time I go back, I need to hope they're not out of stock Southern Hospitality and The Nutty Professor‎ as well as try one of their sandwiches. 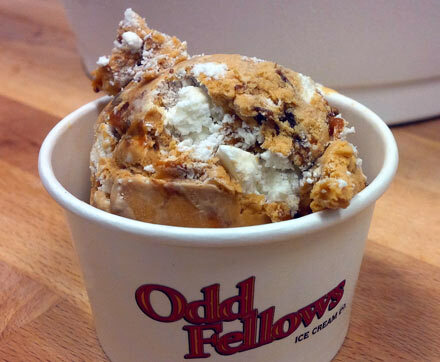 Last stop, my friends back at Oddfellows Ice Cream. You all know about them by now so I'm just going to cut to the flavors since Sam basically force fed me on both visits. 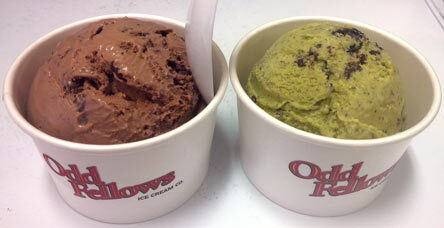 Chocolate Chunk: (left) This is one of the best chocolate flavors I've had. The base is rich, milky, cocoa perfection and there's plenty of dark chocolate chunks to contrast the base. It seems so basic but it's a must try if you ask me. Mint Chocolate Cookie‎: (right) This one suffers from the same issue I had with Mikey's, too fresh of mint for my liking. The cookies are fine and ample but the fresh mint just isn't my thing. Thankfully I had the chocolate at the same time so I could mix the two for a much more pleasant flavor. 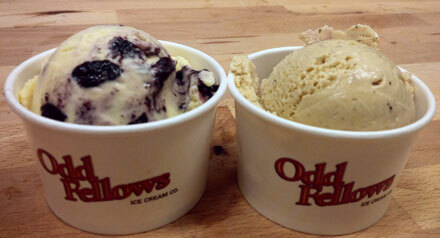 Buttermilk Honey Blueberry: (left) This is a unique one and one of OddFellows first flavors. ‎It's tart, slightly cheesy with lot of blueberries folded in. I liked it a lot and it reminded me almost of a blueberry cheesecake with a bit less sweetness. Black Pepper Strawberry: (right) Sound terrifying? Because it is. This, this just wasn't my thing and I told Sam it wasn't good at all. The black pepper just takes over in flavor and burned my throat. Sam said I need to get out more, I think I just need black pepper to stay away from fruit. 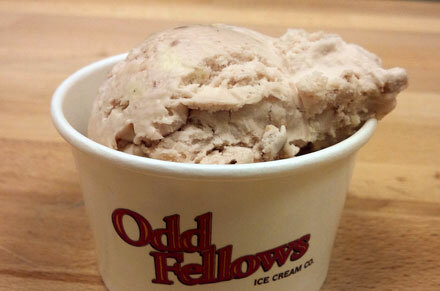 Neapolitan: This is Oddfellows version of Neapolitan and it's as simple as it sounds. It's the classic to a tee and there's not much to say about it minus it being the highest quality Neapolitan I've ever had. Thankfully the strawberry didn't meet any black pepper this time around. 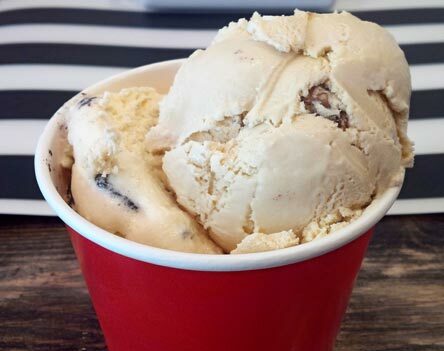 Caramel Brownie: Stop what you're doing and try this flavor if you can. It is by far the best ice cream I have ever had from any scoop shop in my life. It's as if Sam took his burnt caramel ice cream, added some salt to it, mixed in‎ swirls of burnt caramel and chocolate sauce and finally filled it with chunks of delicious, chewy brownie bites. This is sheer bliss and I wanted to take a gallon of it home with me. If you have access to it and haven't tried it, you're making a terrible life choice. Toasted Coconut Milk Chocolate: I also got to try a couple of flavors ‎straight from the machine. This one was forced upon me though when I told him I didn't like coconut. He made a liar out of me because this is the best coconut ice cream I've had. My problem is normally the texture but Sam is using chunks of toasted coconuts, almost like almond slices in size making the texture irrelevant. This is something I need to try a fresh scoop of. 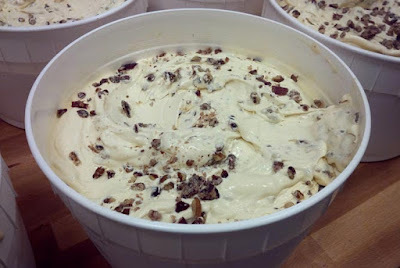 Maple Bacon Pecan: Yes, Sam was also making a bacon ice cream for an event last time I was down. It's as epic as it sounds and I'm not even a fan of bacon. The chunks of pecans and caramelized bacon make this flavor the ultimate in sweet, salty, porky perfection. It'll be available in the shop sometime this week so don't miss your chance to try it. Last up, I got a shake because hey, I wanted a shake. The shake of the week used their chocolate caramel toffee ice cream and it tasted exactly like it did when I had a scoop of it on my first trip. This time, it's drinkable and in a convenient cup and the toffee chunks never blocked the straw which is a plus. Okay, that's all I got. Thanks again to all the companies for taking me in and letting me sample their flavors. I'll be going back down again on the 28th for a special event so if anyone has any places they want me to hit up, please leave a comment. Until next time. I've heard good things about Brooklyn Farmacy! Not sure if they make their own ice cream though...I think elaborate sundaes, sodas, and floats are their specialties! Anon, funny we just got in contact to arrange a meeting new time I'm down. Looks like I'll have to do a NYC post involving sundaes next!